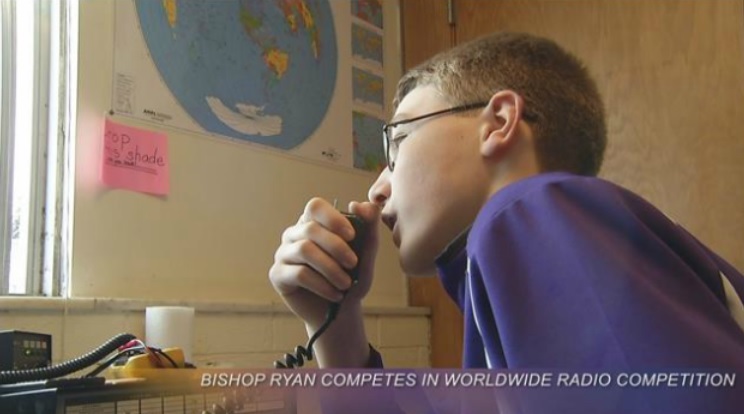 Bishop Ryan’s amateur radio class has entered a week-long, worldwide competition for the first time this year. John Doran stopped by to see how the students enjoyed going over the waves. (John Doran-KX News) For the first time, Bishop Ryan school is getting competitive with their ham radio, entering into the “School Club Roundup” competition. (John Doran-KX News) The objective of the contest, which involves every level of schooling, is to see how many people you are able to connect with using a ham radio. Using the radio isn’t just as simple as picking up a microphone, however, there’s plenty of science and mathematics involved. Students like 8th grader Corbin Okeson know that fitting this in with the rest of their curriculum will one day help land him in a good college.